With nearly 1,300 traditional students scheduled to participate in Thursday’s commencement ceremony for Grand Canyon University at Veterans Memorial Coliseum in central Phoenix, there are at least that many road maps to a degree. Here are a few notable ones from the Class of 2014. Before finding his way to GCU’s pre-med program, Casey Smith dreamed of becoming a country music star — and never imagined he’d hear his own songs playing in an operating room. Although the former member of GCU’s campus worship team has recorded a CD and performed at the Grand Ole Opry in Nashville, his love of science led him to study medicine. Smith was accepted into the University of Arizona’s College of Medicine and will study at the downtown Phoenix biomedical campus this fall. He said GCU’s faculty helped prepare him for med school by encouraging him to seek opportunities with doctors outside the classroom. 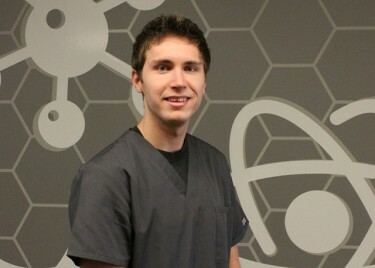 This year, Smith, 21, served as vice president for GCU’s chapter of the AzHOSA health sciences club as he juggled other extracurricular work. He served as a medical scribe in the emergency departments at two metro Phoenix hospitals before he earned a chance to shadow an orthopedic surgeon. Smith said watching his mentor helped him recognize that orthopedic surgery could be his calling, and also because he never knew that doctors listened to music in the operating room during surgery. The surgeon even popped in Smith’s country CD, “This Is So Me,” one day. Smith thought, “This is so perfect.” Music. Science. Helping people. He knew he was on his way to becoming a doctor. 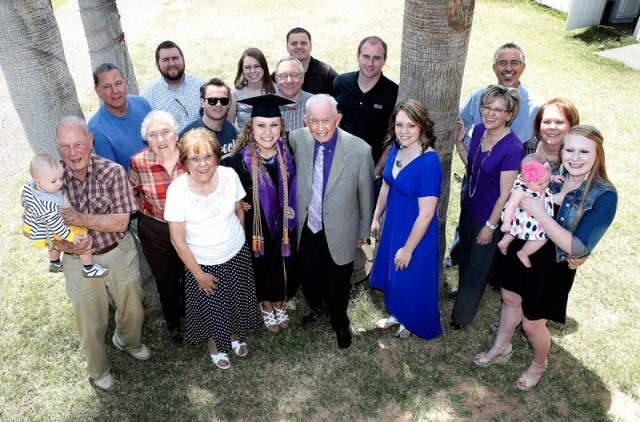 Jenna Chittenden, flanked by grandparents Leona and Lavern E. “Sharky” Baker, is the latest in a long list of family members to graduate from GCU. Who needs an annual family reunion when an alumni gathering or commencement will do? This must be what the Baker clan thinks every time another of its relatives receives a diploma from GCU. You could call it “Holly and Cassie’s Excellent Adventure.” Or you could just say it’s crazy. You’d be right either way. 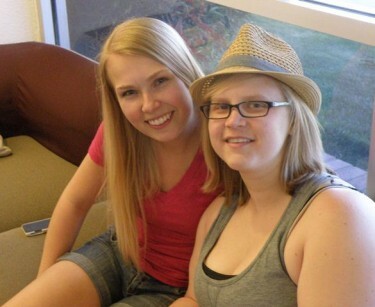 In about a month, Holly Nordquist and Cassie Hawk will board a flight for Chicago on a pair of one-way tickets. The two graduates of the College of Fine Arts and Production — roommates while at GCU — plan to look for work in theatre, TV and film, and they’ll start the search at The Second City, the well-known training ground of improvisational comedy. To save on cash, they will rent a room from Nordquist’s aunt and use the public transportation that is plentiful and reliable in Chicago. As seniors, Nordquist and Hawk were part of the Cantalopes improv troupe, which did get big on campus and put on its final show earlier this week. Hawk also was a videographer for GCU Today, and examples of her work can be found elsewhere on this site. “My family is like, ‘Whatever you want to do, we support you,'” said Hawk, a lifelong Arizona resident who expects to struggle with the Chicago winter (“I’m a wimp”). She wants to write screenplays, and she plans to take classes to further that pursuit. 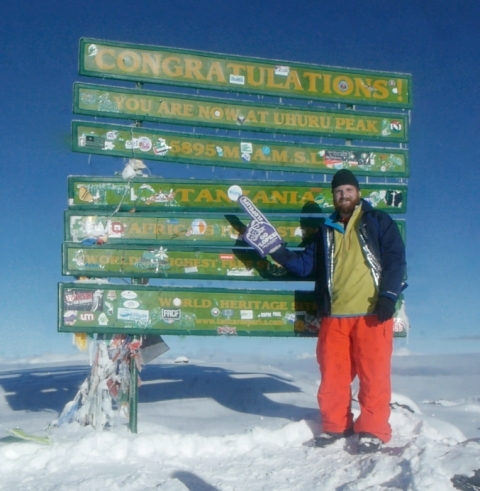 What’s next for a guy who climbed Mount Kilimanjaro in Tanzania last December — and whipped out a purple, “Go Lopes” foam finger at the summit? Well, there always has been a next for Josh Nelson of Spokane, Wash. He started out at Point Loma Nazarene University in San Diego as a soccer player. Then he moved to Chicago to start a business and to Puerto Rico to live the beach life. In 2009, he moved to Phoenix, where he coached seventeen club soccer teams while working on the bachelor’s degree in communications he received Thursday from GCU. His sights are set on starting companies in video production and Internet marketing. His bucket list for the near future includes climbs of Machu Picchu (2015) and Mount Everest (2016), soccer’s World Cup (2018) and running with the bulls in Pamplona, Spain (whenever he can fit it in). “We didn’t know when we’d be on the African continent again,” said Nelson, 31, whose sister Sara (Nelson) Roy is a student services adviser for GCU. His mother, Zanna Nelson, is an enrollment counselor for the University. Washington, D.C., should keep an eye out for Katie Scates. She might be on the way soon. Scates, 20, received her bachelor’s in accounting at Thursday’s commencement after only three years at GCU. The Prescott native has spent the last four months serving as a legislative research staff intern for the House of Representatives appropriations committee at the State Capitol. 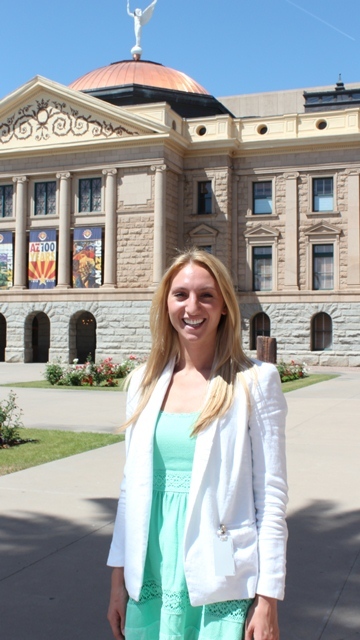 She is thought to be GCU’s first legislative intern, and she admitted to knowing little about lawmaking when she first began the internship. She is responsible for researching, summarizing and presenting bills in committee and caucus. 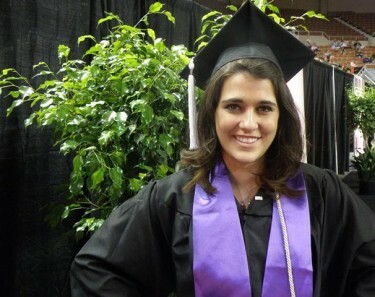 Scates was highly involved on campus during her time at GCU. She worked as an accounting tutor and served as a dorm resident assistant. She grew up a self-proclaimed “government nerd,” participating in student council in high school and attending numerous summer government camps, including one in D.C. She is considering law school down the road, and she plans to apply for one of the full-time legislative positions offered to graduating interns. Allison Bauer came to GCU to be an actor. Four years later, the 22-year-old from Tucson can still deliver a line and belt out a song, but she also can: create a wolf ear cowl; cast a wicked-scary witch’s mask; sew wigs and pin wayward beards; manipulate latex and silicon into dramatic headgear; and apply makeup that helps transform everyday students into stunning characters. Graduating Thursday with a bachelor’s in theatre and drama, Bauer beams with pride to be part of a senior class that set sky-high standards for future students in the College of Fine Arts and Production. Early on, she acted, then she fearlessly stretched her wings into hair and makeup – and beyond. Earlier this year, she became the seventh student in GCU history to win an ariZoni, the local version of Broadway’s Tony Awards, for hair and makeup in COFAP’s production of the musical “H.M.S. Pinafore.” The award was shared with staff member (and alumna) Kay Gray. By hanging around with Nola Yergen in the costume shop, Bauer also learned to design theatrical wardrobes from concept to completion. As a result of her experiences, she has helped dress a show for Arizona Opera, auditioned for Phoenix Theatre, and is acting and designing for “Oh, the Humanity!,” a musical opening Friday, May 2, at the Brelby Theatre Company in Glendale. Bauer wants to give L.A. or Chicago a try someday and, eventually, she might be directing a group of aspiring actors in her own classroom. “I would love to teach kids what GCU has taught me to do,” she said. Eryn Olson came to GCU a shy kid from Bloomington, Minn., who never had been away from home for more than a week. Less than three years later, she has her bachelor’s degree in sports management, plans to begin working in July on her MBA in accounting, is a key player on the women’s golf team, is vice president of the Student-Athlete Advisory Committee and dreams of working in sales for a major golf equipment manufacturer. Oh, and one other thing: She’s not shy about any of it. Olson grew up playing golf and hockey but chose the less violent sport. However, golf also can be taxing on the body, and Olson has been a regular visitor to the trainer’s room for treatment of her left elbow. Her big golf moment came last year when she won the GCU Invitational, and she’s aiming for another title this weekend. 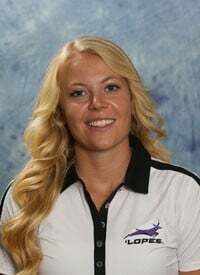 As soon as commencement was over Thursday, she had to get to Longbow Golf Club in Mesa to resume preparations for the Western Athletic Conference Championships, which begin Friday. “I just told my family, ‘Have a good time, and I’ll see you around 7,’” she said. Patti Hammond had 11 years of experience in accounting when new management at her firm dismissed her for not having a bachelor’s degree. “My husband (Adam) and I decided I would never be fired from a job again,” she said. So Hammond enrolled at Arizona State University, where she had wanted to go since she was 15, but quickly became disenchanted with sharing a lecture hall with 300 students. She considered the University of Arizona and Northern Arizona University before she saw an ad for GCU. “I thought, ‘Huh … Christian school … that can’t be a bad environment to be around,’” she said. Assured that GCU’s class sizes are much smaller, Hammond transferred in June 2013 and was thrilled to learn that she would be able to graduate in less than a year. Had she stayed at ASU, she wouldn’t have graduated until December because of extra non-accounting requirements. “That’s eight months of employment,” she said. Thursday was the culmination of a team effort that included her mother, Joy Ditman, and sister Darla Ditman. Hammond, you see, has six children ranging in age from 4 to 22 – two of her own and four stepchildren. Hammond has two interviews scheduled for next week and hopes to land a position that will help her pay for a master’s degree. But she also has something else in mind: spending time with her kids. “I’ve got to rekindle those relationships,” she said. Chantalle Violette is far from squeamish. The 21-year-old graduate of GCU’s forensic science program enjoys studying blood spatter and understands the basics of interpreting DNA profiles. After completing her undergraduate degree in three years, Violette begins her online master’s program through the University of Florida next month. In less than two more years, she aims to earn her pharmacology master’s with a forensic science emphasis and go to work as a crime-scene specialist or DNA analyst. The gory details sound horrific. But understanding how to accurately collect information from the aftermath of crimes is necessary to providing police and prosecutors with the evidence to ensure convictions. 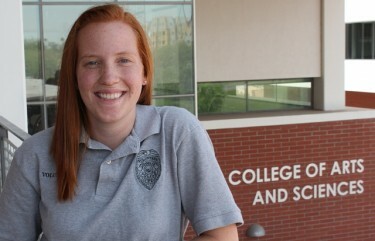 To bolster her portfolio, Violette volunteered at Chandler Police Department’s crime lab. She currently helps to enter latent fingerprints from 1980s case files into an evidence database — a project that’s hugely valuable to police departments, because many are still working to digitize older evidence to make systems more comprehensive and searchable. 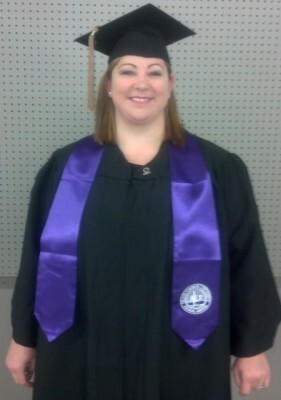 Violette is one of 10 graduates of the College of Arts and Sciences forensic science program this year. The 2-year-old program expects to graduate dozens more next year. With the hands-on experience she gained at GCU, Violette said she understands the systems and technologies used in professional crime labs — and is ready to go focus on the details that solve crimes. Graduating student-athletes Ben Ponnet and Killian Larson made noise for the Antelopes this year in GCU’s first year in NCAA Division I. Ponnet (volleyball) and Larson (basketball) set school records and finished in the top statistical categories in their respective sports. Both plan to pursue pro sports careers. Ponnet, 21, who received a bachelor’s in sports management Thursday, left his native Belgium to join the Antelopes in 2010. The outside hitter was named first team All-Midwestern Intercollegiate Volleyball Association in 2012 and 2013 and second team All-MIVA in 2011. He holds the GCU record for kills with nearly 1,500 and service aces with close to 130. He will return to Belgium this summer to attend a tryout for a pro team in France. Larson, 23, earned a master’s in business leadership. 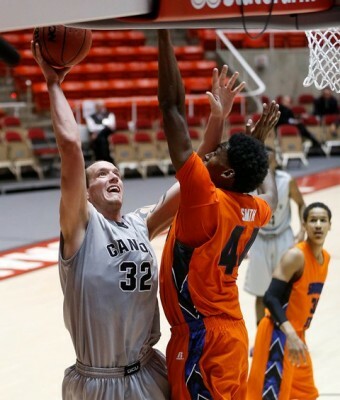 He helped lead the Lopes to a third-place finish in the Western Athletic Conference, averaging nearly 12 rebounds per game — one of the best averages in all of Division I. Larson transferred to GCU from Division II Dominican University in California and racked up nearly 900 points and 700 rebounds in two seasons. He attended the Portsmouth Invitational Tournament, an invitation-only NBA pre-draft camp, recently and hopes to join an NBA summer league team or play for a pro team overseas. GCU is Garrett Morgan Wilton’s third university and, for him, a charm. Wilton, 25, decided in the sixth grade to go into education because of the influence his science teacher in Tucson had had on him. Paying for college would be another thing, however, so Wilton enlisted in the U.S. Navy as a reservist as soon as he graduated from high school, always keeping an eye on the higher-education prize. He started at Arizona State University, then was deployed to the Middle East, based in Kuwait as part of forces conducting anti-piracy operations. He saw a lot of the world, including the Mediterranean Sea, the Horn of Africa and dozens of countries. Returning to the States, Wilton enrolled at Northern Arizona University but soon was deployed to Germany for a year. Back home again, in the fall of 2011, Wilton enrolled at GCU because he wanted a more personal classroom experience at a faith-based university. With no further deployments to come, he buckled down and is graduating with a B.S. in secondary education, emphasis in social studies. At GCU, Wilton’s professors, coursework and individualized attention in the classroom were everything he had hoped. He loved being immersed in a community, rather than simply being a face in the crowd. 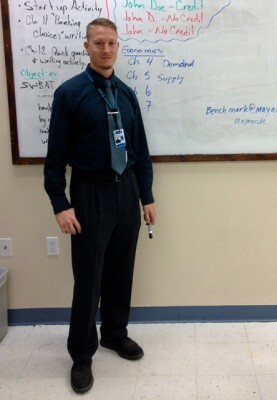 Wilton just finished student teaching at Maya High School, a Phoenix charter school where his military training, polite attention to discipline and management style were helpful. He is enrolled in the master’s degree program in curriculum and instruction at Colorado Christian University in Lakewood, where he will begin classes in the fall. I might start my Ed.D. program at GCU in June. Are there any success stories from those who have earned their Ed.D. from GCU? Please let me know, thanks!